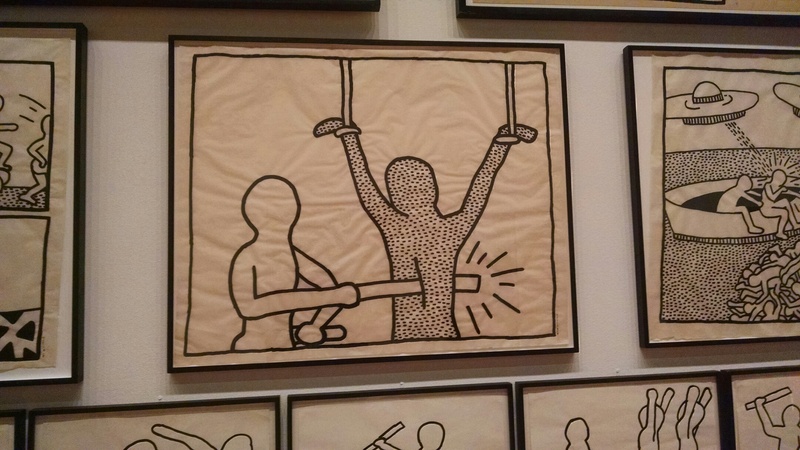 The de Young museum has a powerful collection of Keith Haring’s more political work. His familiar style can sometimes mislead one into thinking it’s a “one look fits all” type of work but these images grab the viewer by the lapels more often than not. Striking is their scale and simplicity. Often made on tarpolins with store bought paint, and many dashed onto vacant advertising panels on New York subway trains, the images are stark and mesmerizing. Like the Aboriginal dream paintings that his repetitive use of symbols and icons resemble, the images transport us to a dream, or nightmare, world where ordinary humans are sujected to endless tortures, dismemberments and death at the hands of large, looming figures that are animalistic or machine-like more often than not. The TV monster and the helpless man. The injunction to Kill your Television has come too late. 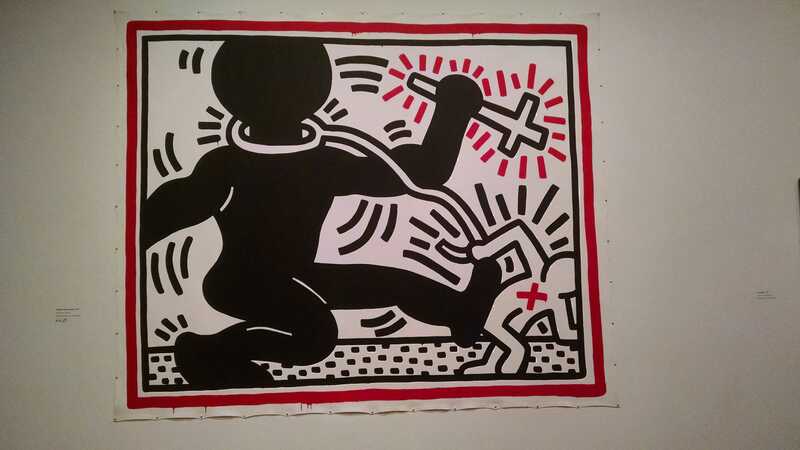 Haring’s figures are captives and victims of forces they may have created but no longer control. It can be easy to think of Haring as an “easy” artist: easy on the eyes, easy on the mind, easy, sometimes, on the pocketbook with his accessories, knockoffs and mass produced items, but a political motif runs vividly through this show, if not his oeuvre. He clearly finds little solace in the Great Society or the war in Vietnam, or Reagonomics or the continuing, and still continuing, racism, exploitation and media circus that surrounds him and that he both cultivated and subverted. Elsewhere he associated the crown with Basquiat and here it seems to crown the central figure who leaps between a bleeding heart and headless body. The museum gift shop is chock full of Haring-abelia for the acquisition minded, but the real gift is in the work itself. It haunts and moves and provokes and reminds us that there is a dignity in the gesture of resistance, of a great refusal of that which is everywhere celebrated and normalized… until it isn’t. Some images are dense with iconic doodles and some have the starkness of a Philip Guston anti-KKK painting or Guernica. This is one of them. 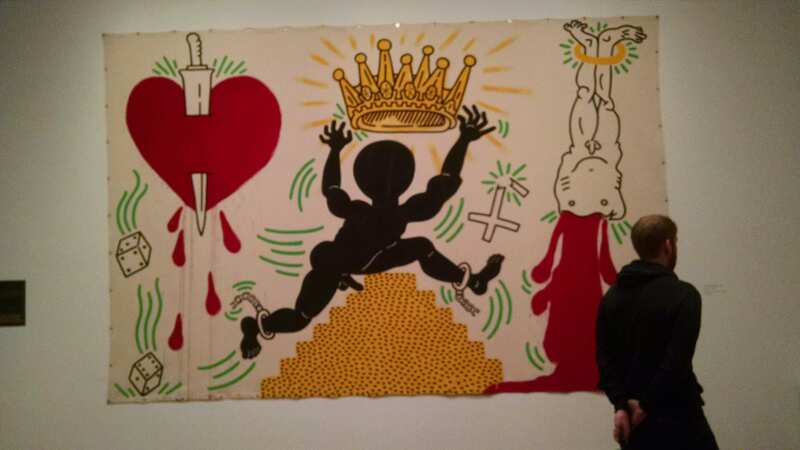 This entry was posted in Art and tagged Aboriginal art, de Young museum, dreamworlds, Keith haring, modern art, political art, politics and art, racism by billnichols99. Bookmark the permalink.